When members’ health and safety were at risk by an employer policy that mandated both first and last names on employee name tags, the Executive Board and members of CUPE Local 5111 worked together to defend their members’ rights while facing the possibility of discipline. In fact, only one day after the policy was enacted, union members had a petition circulated requesting the policy be rescinded, and the local began its determined action, that took several years, until it reached a successful conclusion for the Union at an Arbitration that ordered the policy to be rescinded as it was found to endanger workers and violate provincial workplace health and safety law and the Collective Bargaining Agreement. The grievance began in June 2012, and the arbitration ruling was delivered in December 2015. CUPE Local 5111 was comprised of over 2,200 members working in the health care system in long term care, acute care and mental health services in the communities of North Battleford, Lloydminster, Cut Knife, Edam, Goodsoil, Loon Lake, Maidstone, Meadow Lake, Neilburg, Paradise Hill, St. Walburg, Turtleford and surrounding areas in Saskatchewan. 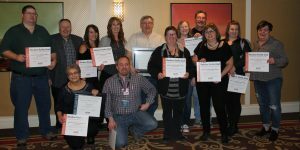 Effective January 1, 2018, CUPE Local 5111 merged with other health care locals in Saskatchewan to form CUPE Local 5430 – the largest health care union in Saskatchewan. 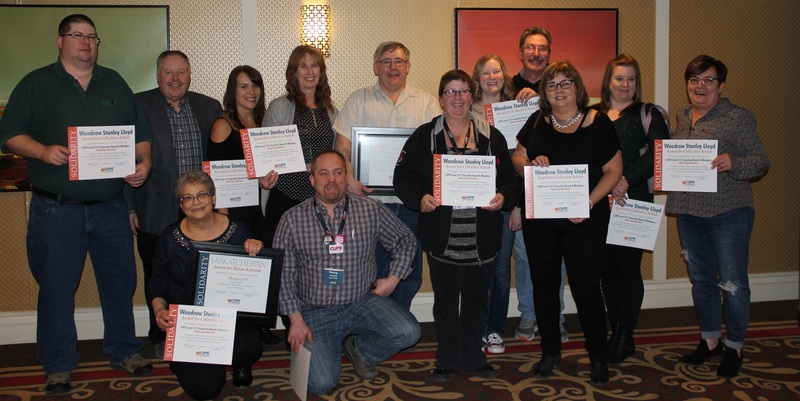 Established by CUPE Saskatchewan Division, the Woodrow Lloyd Award recognizes a group of union members responsible for a remarkable achievement, outstanding contribution or exceptional activism. The award is named after Woodrow Stanley Lloyd who succeeded Tommy Douglas as the CCF/NDP Premier of Saskatchewan to implement the first universal and comprehensive publicly-funded health care insurance program in Saskatchewan and North America known as Medicare in 1962. Woodrow Lloyd is a reminder that the establishment of Medicare took a collective effort to achieve, and the courage of many, to advance a more just and humane society. Do you know a CUPE group to nominate for a Woodrow S. Lloyd Award? Nominations are held previous to each Annual Convention in March. Contact the CUPE Saskatchewan office.